The instrumental music performed on this CD is by a musical duo, Bruce Hecksel and Julie Patchouli. Both are expert guitarists and perform as an acoustic singer-songwriter duo called Patchouli. The couple performs frequently so this music has been road-tested in front of audiences. As so often happens, compositions change through frequent performances and with different audiences, so a couple of the cuts here are revised re-recordings of earlier works that have transformed in time. The music featured here is nuevo-flamenco style, with an emphasis on a strong rhythmic guitar underlying attractive Latin-style and ethnic-style melodies. The recordings are beefed up a bit with the addition of percussion elements. Bruce plays classical nylon-string guitar, along with 6- and 12-strings, bass, keyboards, djembe, congas and other percussion. Julie plays acoustic rhythm guitar, bass, shakers, tambourine, dumbek, congas, and djembe. The music has a strong Latin flavor to it. Track 4 – Troubadors has a strongly rhythmic flare and and upbeat, swinging melody. Track 2 – The Swan is gentler and more lyrical. Track 5 – The Story was inspired by a vision of Native American elders sitting around a campfire sharing tribal history with children. It evokes a group sitting in a circle around a bonfire beneath star-filled night sky. Track 9 – The Alchemist was inspired by Paul Coelho's book, “The Alchemist.” The focus is on transformation and how people change through life. Track 7 – Danu is a musical interpretation of water. Danu is an Irish-Celtic river goddess, and this song gives a strong impression of flowing water and the bubbling, irrepressible movement of a river. Track 11 – Kokopeli was inspired by the Native American fertility deity, and the song symbolizes “a special place where you can be contemplative – fertile ground where you can grow as a person,” Bruce explains. Track 12 – Elements is fairly laid back. It was originally recorded as “Absinthe” on “The Mother Night” album, but changed so much in performance it's presented here in the new version with a new name. “Dragonfly” demonstrates awesome mad guitar skills by both musicians. All of the songs are in the nuevo-flamenco style and that presents some limitations, but the duo does a great job of exploring how melodies, rhythms, and musical and instrumental textures can vary within that style. Listeners get benefits from recordings made by actively touring musicians. Sometimes studio performers can write more for themselves than for listeners, and can get spoiled by the immense range of possibilities offered by multi-track recording capabilities. 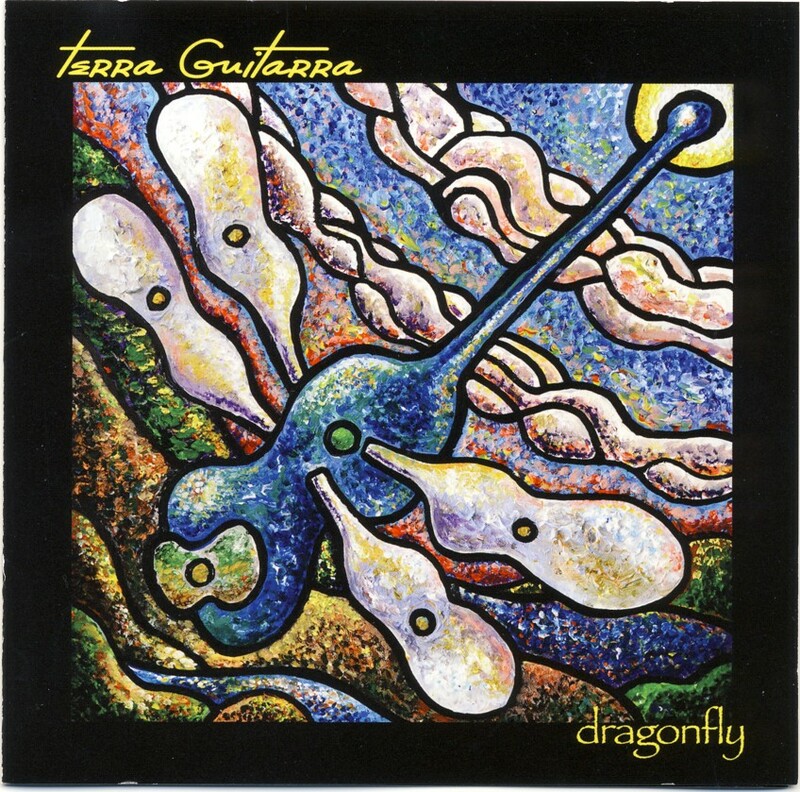 Terra Guitara has to work in live settings with what's on hand. These tracks aren't overproduced; while there are some extra percussion tracks, there's not too many ornaments piled onto the Christmas tree here. The music gets what it needs to be satisfying without creating a wall of sound. For listeners that enjoy Latin-style instrumental guitar music for lazy afternoons, driving around, and for dancing or exercise, this is a finely produced album recorded by expert musical story-tellers sharing their tales with listeners.